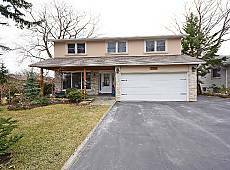 Almost 2700 square feet plus full finished basement in high demand area. Extensively upgraded, clean & unique house.Hardwood & engineered floors, high quality ceramic & laminate floors throughout.Granite counters & stone back-splashes in the kitchen & washrooms. 2 skylights, cathedral ceiling and floor to ceiling fireplace in main floor family room. separate entrance to professionally finished & stunning basement with kitchen, washroom,5th bedroom, recreation room with copper fireplace and games room with rough in bar. Backyard oasis with huge inground pool, mature trees and perennials. Backyard oasis with huge pool.